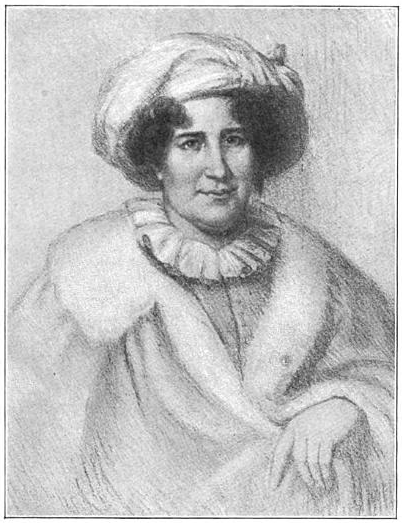 Margaret Bayard Smith, “Margaret Bayard Smith,” Histories of the National Mall, accessed April 23, 2019, http://mallhistory.org/items/show/118. Margaret Bayard Smith was a writer and a vital figure in the early social life of Washington, DC. Her letters and diaries provide some of the best descriptions of early Washington. In 1837 she recorded what the Mall looked like when she and her husband moved to Capitol Hill in 1800: "Between the foot of the hill and the broad Potomac extended a wide plain, through which the Tiber wound its way. The romantic beauty of this little stream was not then deformed by wharves or other works of art." Hunt, Gailliard, ed. The First Forty Years of Washington Society. New York: Scribner, 1906. Quotation from page 10. View original document. Margaret Bayard was born in Pennsylvania, the daughter of a revolutionary war officer. In addition to her seven siblings, her parents also raised her three orphaned cousins. Margaret and her sisters attended the Moravian School in Bethlehem, Pennsylvania, where they learned German, arithmetic, and literature, in addition to embroidery and the other domestic skills usually taught to young women. In 1791, at the age of 13, Margaret went to live in New York City with one of her sisters and her brother-in-law, through whom she met New York intellectual elites. In 1800, she married Samuel Harrison Smith, a newspaper writer and publisher who was friends with Thomas Jefferson, then president-elect. Shortly after the wedding the Smiths moved to Washington, DC, where at Jefferson's request Mr. Smith established a newspaper, the Daily Intelligencer. The Smiths were among the earliest long-term, year-round residents of the new national capital, and became part of its core social community. At her home in Washington, Margaret Bayard Smith entertained politicians, artists, authors, and journalists, of all political persuasions. When she could, Smith spent time at her country house, Sidney, which although removed from the city was still within the boundaries of the District of Columbia. There, she had an attic room where she could read and write without the constant interruptions she experienced in the city. She wrote two novels published in the 1820s, as well as short stories, poems, and short non-fiction essays that were published in literary magazines and newspapers. Smith was also a prolific diarist, recording her thoughts in a series of commonplace books for most of her adult life. In addition to teaching her children, Smith gave basic lessons in reading, writing, and math to local children, including poor and African American children, and her servants. At one point her informal schoolroom served ten students. Her philanthropy extended beyond education; she helped establish an orphanage and school for girls in Washington.